Reading and share top 11 famous quotes and sayings about The Straight And Narrow by famous authors and people. Browse top 11 famous quotes and sayings about The Straight And Narrow by most favorite authors. 1. "I won't offer you a tired admonition to avoid my path. I won't advise you to stay on the straight and narrow. I won't suggest that you make good choices. I won't even tell you to do the right thing. You can get that kind of advice from teachers and parents and TV evangelists, and if you are like me, you wouldn't listen anyway. I just make one suggestion.Know what path you're on." 2. "My fictitious characters will take the bit between their teeth and gallop off and do something that I hadn't counted on. However, I always insist on dragging them back to the straight and narrow." 3. "My dad's era believed that there was something noble in being a good guy - the kind of guy that lived straight and narrow, told the truth, and stood up for what he believed was right." 4. "Because I have a girlfriend, I try and take the straight and narrow path, which is good because it prevents VD." 5. "I think God's wrath and purgatory are the only things keeping me on the straight and narrow. I like the idea of purgatory. It's like a cosmic do-over." 6. "Wow, Mrs. Collins is a freaking miracle worker. Dangerous Noah Hutchins on the straight and narrow. If you don't watch out she'll ruin your rep with the girls. "I lowered my voice. "Not that it matters. I only care what one girl thinks about me." 7. "Maybe we try too hard to be remembered, waking to the glowing yellow disc in ignorance, swearing that today will be the day, today we will makesomething of our lives. what if we are so busy searching for worth that we miss the sapphire sky and cackling blackbird. what else is missing?maybe our steps are too straight and our paths too narrow and not overlapping. maybe when they overlap someone in another country lights a candle, a coupleresolves their argument, a young man puts down his silver gun and walks away." 8. "We all start out knowing magic. We are born with whirlwinds, forest fires, and comets inside us. We are born able to sing to birds and read the clouds and see our destiny in grains of sand. 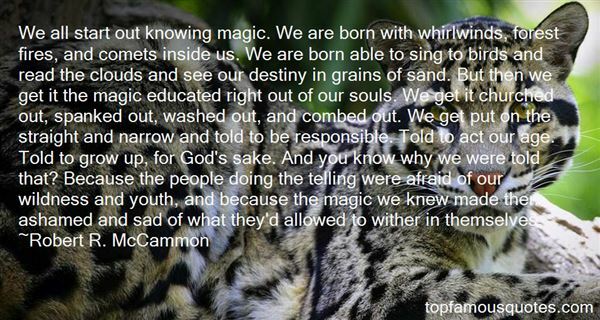 But then we get it the magic educated right out of our souls. We get it churched out, spanked out, washed out, and combed out. We get put on the straight and narrow and told to be responsible. Told to act our age. Told to grow up, for God's sake. And you know why we were told that? Because the people doing the telling were afraid of our wildness and youth, and because the magic we knew made them ashamed and sad of what they'd allowed to wither in themselves." 9. "But - but the greatest way to witness is by walking that straight and narrow and also realizing that you're going to mess up. That's what grace is for. We're going to fall, but we've got to get back up. And you've got to improve. And that's what I'm all about." 10. 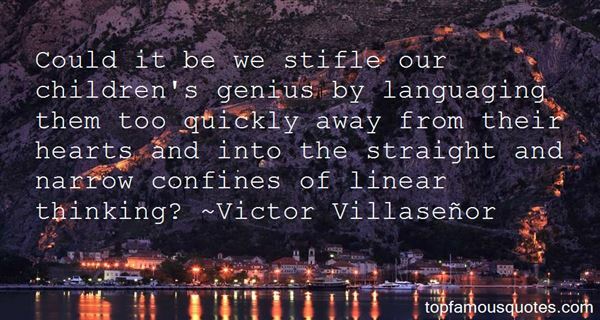 "Could it be we stifle our children's genius by languaging them too quickly away from their hearts and into the straight and narrow confines of linear thinking?" 11. "When I was coming up as a kid, there were programs that kept me out of trouble and on the straight and narrow in South Central Los Angeles, and I always felt that when I got to a stage where I could provide similar opportunities to kids then I would do that." CRANBERRY JELLY IN A CAN 2. EXPLODING BISCUITS 3. NIPSY DOODLES 4. RAINBOW SPRINKLES 5. TOILET PAPER 6. MONEY"